Robson Corporation company information. Robson manufactures and sells High Quality Integrated signs factory direct. Robson Corporation began in 1985 and incorporated in 1986. We have been in continuous operation since. In fact Robson Corporation has sold, manufactured, and delivered more integrated all-aluminum signs than all other competitors combined. Our state-of-the-art 45,000 square foot manufacturing facility is located at 2231 Whitfield Park Loop Sarasota, Fl 34243 and our sales offices are located only 1 mile away from our plant at 6015 31 street East. 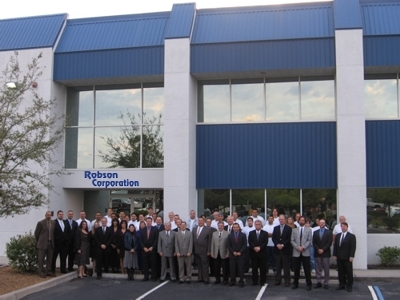 Robson Corporation is home of the longest waterjet cutter in North America. And the finest sign craftsmen in the world. We are the Manufacturer buy DIRECT!